The space of the room is to promote the development of your child, so you should choose unique and functional furniture. With the help of fancy handles, you will create a place where your children will not be bored. Young people usually have an intense lifestyle. Playing football in the comfort of your room, skateboarding or meeting with friends is a permanent package of free time. By choosing Young Furniture you do not have to worry that your young man's energetic character will destroy the arrangement of the room. Thanks to the precision of workmanship and care for every detail and use of the highest quality materials, the furniture from this collection is in perfect condition for years to come. WOW collection is a system of furniture for creative teens. Asymmetrical solid shapes and a unique combination of colors: graphite, nagano oak and green iguana, allow you to create a modern and comfortable interior. 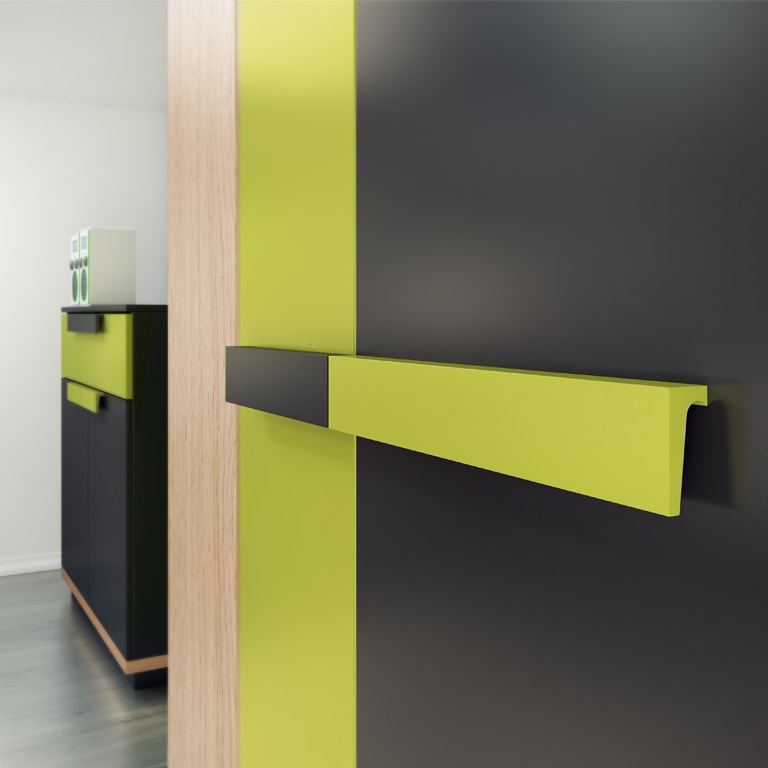 Particular attention is paid to the ingeniously designed desk, which connects to the rotating rack that gives the uniqueness of each arrangement. The WOW system is ideal for both girls and boys of all ages. Create an opportunity for your child to enter adulthood with power! A clear combination of colors and unusual form of furniture will create ideal conditions for your children's development. The dynamic design of the furniture will be well matched with the temperament of the young man. 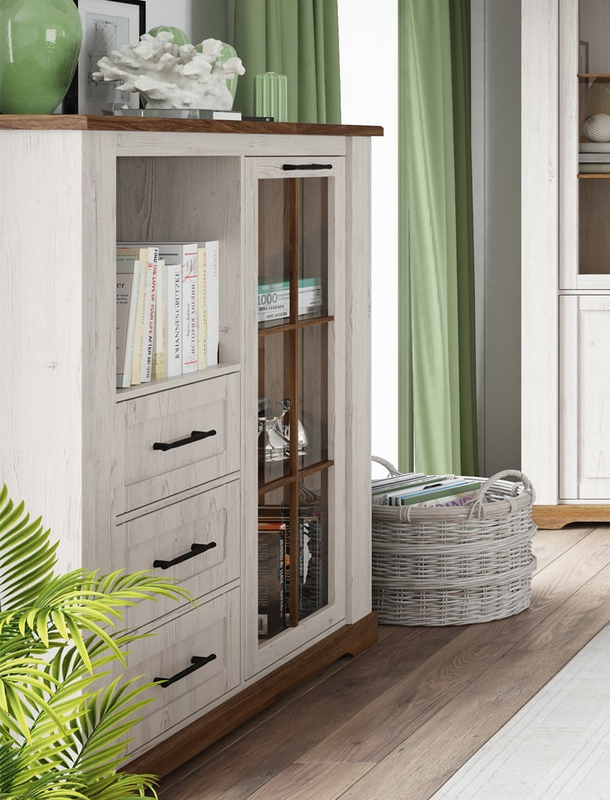 Children love uncomplicated solutions, so Wow furniture systems have handy handles that allow quick access to the contents of cabinets, cabinets and chests. Opening and closing has never been so easy. HAPPY SZYNAKA Furniture is a modern collection for a children's or youth room. It is made of chipboard in an interesting combination of colours. The predominant light shade Larch White Sibiu brings lightness to the interior, and Beech Iconic emphasizes the shape of the elements, making them more expressive. Original cut-outs instead of handles on the facades emphasize the minimalist character of the collection. Wardrobes are additionally can be equipped with LED lighting, which lights up, when the door is opened. Furniture Happy Szynaka allows to equip the place for relaxation and study. Country collection is the furniture that excites the emotions. Their unique form, precise workmanship and elaborate details will allow you to create arrangements that reflect your individual expectations. The harmonious color range and non-luminous details emphasize the individual style of each element. The furniture of the Country line will create an extraordinary living room, where everyday life becomes an unforgettable experience and a cozy dining room that is a perfect place for many unique meetings. Make sure all the best thoughts are connected to your home. Get the individual charm of your room. Stick to the things that matter to the family and set new trends that reflect your individual style. Because all the best starts in your home. You will find cupboards, commodes, coffee tables, cabinets, tables, and glass cabinets. Any self-respecting period home needs to have a real table. One which will persuade the lady of the house, that it can hold everything and there is no danger of nasty surprises. A table is an item of furniture which is most frequently used. This is where breakfasts, dinners and suppers are served and as a result its durability is key. 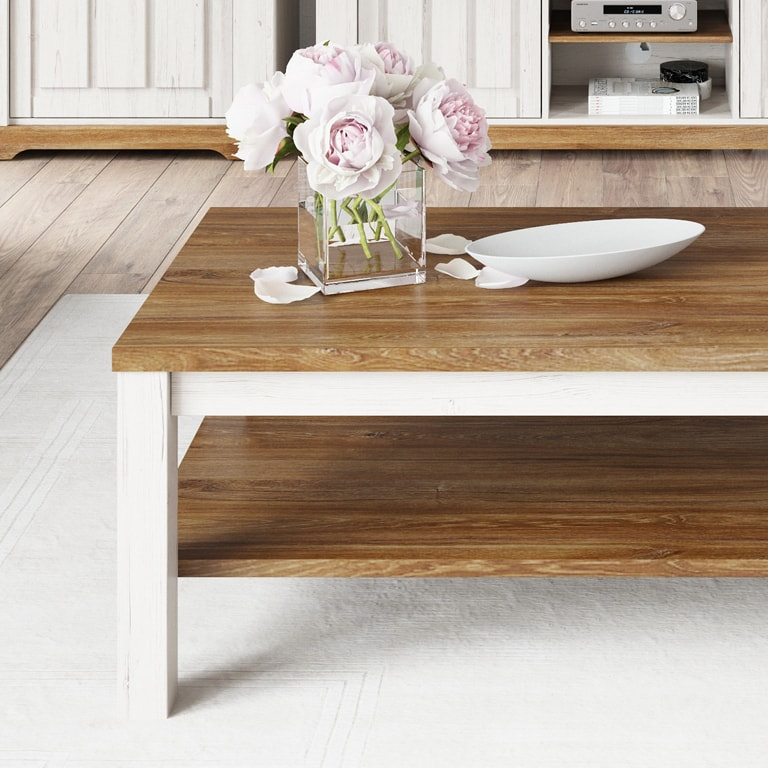 Available in three colors: oak sonoma, wenge, white glance.